If not in the line of sight, objects can't be detected. How it works: Light pulses are sent out, reflected off objects and received for interpretation. What it can see: Day or night, specific objects, such as deer, can be defined as well as their distance from the car. Because paint reflects differently than the road surface, lines can be seen as well. DETROIT -- Delphi Automotive Systems, working with a Silicon Valley startup, says it plans to bring a new, solid-state lidar system for self-driving cars to market for less than $1,000 per car. But today's lidar systems are prohibitively expensive. The unit on top of Google's self-driving car, for example, made by Velodyne LiDAR, retails for about $70,000. The Delphi system, which is being developed with Quanergy Systems Inc., places a lidar sensor at each corner of the vehicle, Jeff Owens, Delphi's chief technical officer, told Automotive News. Owens said each sensor could cost as little as $200 each. It's a technology that likely will be used on the highest levels of autonomous cars, so-called Level 3 and Level 4 vehicles, which can perform all of the safety functions without driver input. 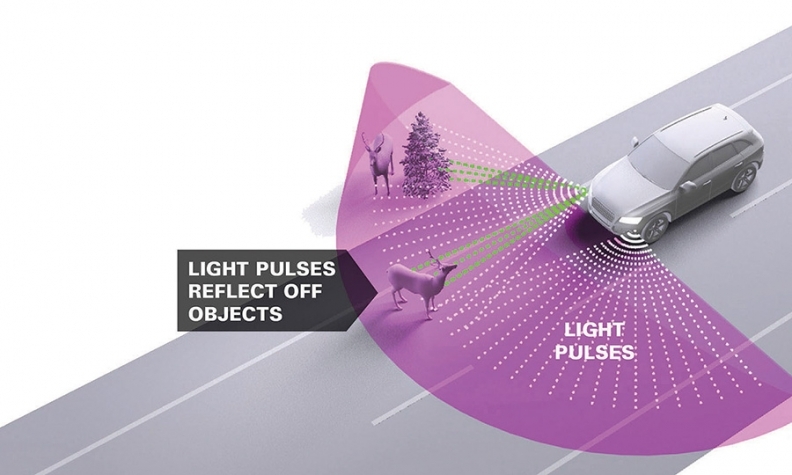 Current lidar systems use individual laser emitters and receiver components that spin or are swept across a field of view, says Delphi. A solid-state lidar system uses tiny mirrors on an integrated circuit to scan in every direction and create a 3-D image around the car, Owens said. A silicon chip is scalable and less expensive to produce, and it's more robust and reliable because there are no moving mechanical parts, according to Delphi. This year, Delphi tested a self-driving car, traveling from California to New York, and concluded that cameras and radar won't be enough to ensure 100 percent safety. "We found as we looked at the data that lidar is going to be instrumental, we think, to fully automated future vehicles," Owens said this month on the sidelines of an industry conference here. Radar is able to detect most objects, but it cannot discern a dog from a Dodge. It just determines something is there. Cameras can read roads signs and lane markings and detect other objects, but they lose effectiveness in snow, rain and direct sunlight. Lidar, Owens says, "bridges the two technologies and provides a complete system." Quanergy, founded in 2012, has inked contracts with Mercedes-Benz, Hyundai-Kia and Renault-Nissan for its sensing technologies. Delphi bought an undisclosed stake in Quanergy in July, and engineers from both companies are working on the lidar system. Quanergy is developing the technology, and Delphi likely will produce it. "The solid-state lidar [patents are] Quanergy's," Quanergy CEO and co-founder Louay Eldada wrote Automotive News in an email. "The role of Tier 1 automotive suppliers includes system integration and ensuring compliance with automotive standards." Delphi is about a year from testing solid-state lidar on a vehicle. It could be as many as 10 years down the road before a Level 4 autonomous vehicle is ready for production. Said Owens: "Just as radar transitioned in the last 20 years from a mechanical sweep to electronically scanned or a beam-forming kind of approach, lidar is going to do exactly the same thing."